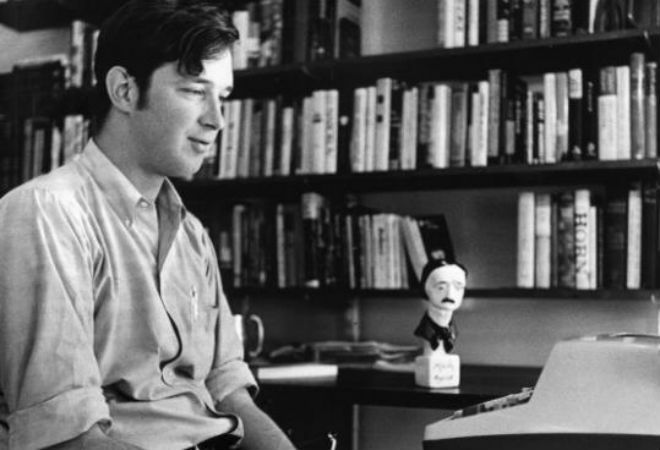 He brought dinosaurs back to life, delved into the dangers of nano-technology, and spun an epic yarn based on Beowulf, but fans of Jurassic Park, The Andromeda Strain, and Timeline—the books that defined Michael Crichton‘s career—may not know about his early years as a writer of gritty crime novels. What’s more, they’re just as engaging and memorable as his bestsellers. With new life breathed into these works by Hard Case Crime, Crichton’s legacy lives on; readers can afford to lose a few nights of sleep to get through these suspenseful early page turners. Hard Case, known for reissuing out-of-print crime classics by Donald Westlake, Lawrence Block, and James M. Cain along with new material like Stephen King’s Joyland, has just put out eight early novels that Crichton originally released under the pseudonym John Lange. It’s the first time these books have been released with the name “Michael Crichton” on their covers. The new editions feature gorgeous pulp novel covers by Gregory Manchess and Glen Orbik. To coincide with the fifth anniversary of Crichton’s death in 2008, the first four books—Scratch One, Easy Go, the Edgar Award-nominated Grave Descend, and Binary—came out this week. The next four—Odds On, Zero Cool, The Venom Business, and Drug of Choice—will hit store shelves on November 19. Crichton wrote these novels between 1966 and 1972 while he was in his twenties and needed to help his way through medical school at Harvard. Even then, his works displayed a mastery of the crime thriller and a knack for sneaking in nail-biting plot twists. The stories are briskly paced, showing off Crichton’s lean prose and ear for dialogue—a precursor to the style he would hone for later novels like Sphere and Congo. Drug of Choice: A medical doctor looking into a mysterious new drug that leaves patients in a temporary coma-like state finds himself on an island that promises every possible pleasure. This slim novel recalls the climax of Crichton’s Terminal Man, ending on a high note without any falling action. At the end, the repercussions of the character’s actions are ambiguous. The story also includes a resort/theme park setting that would later surface in Crichton’s Westworld. Binary: A federal agent races against the clock in a match of wits as he attempts to thwart a political radical who plans to unleash a deadly nerve gas in San Diego. It’s like the TV thriller 24 but with only a 12-hour timeline. In 1972, Crichton directed the film adaptation, Pursuit, which lacked the urgency and suspense of the book. What’s most frightening about this scenario—as in Crichton’s Prey or The Andromeda Strain—is that it seems far more realistic in the year 2013. Grave Descend: A diver, hired to salvage treasure from a sunken vessel, finds himself caught in a plot with deadly criminals—and deadly alligators. This short novel recalls low-budget ’70s exploitation flicks and action films. It’s lean and gritty but with strong characters and a sensible plotline. Odds On: A computer-planned heist leads a group of criminals to a luxury hotel to steal priceless artifacts. What they didn’t plan for are three gorgeous women with their own agendas. Sounds like a job for the Ocean’s Eleven crew but what Crichton’s criminals have that Clooney’s don’t is a willingness to use deadly force. Although the computer technology in the novel is now out of date, it doesn’t detract from the story; in fact it transforms the story into a period piece that could easily be adapted into a modern movie. Easy Go: An Egyptologist searches for a buried treasure, but can he and his band of thieves escape with the treasure in hand? This rollicking adventure gives Indiana Jones a ride for his money and recalls elements from Universal’s original black-and-white Mummy franchise. Scratch One: An American lawyer is the victim of mistaken identity when a group of international assassins mistake him for the secret agent who was sent to track them down. This template has been used many times for books and films (see: North by Northwest): exotic locations, vacations gone awry, malicious villains. This story doesn’t include Cary Grant being chased down by an airplane, but it does seem like something Alfred Hitchcock would have directed if he had chanced upon the source material. The Venom Business: A snake expert who is also a rare artifacts smuggler accepts an assignment as a bodyguard for an old acquaintance. A good bodyguard is hard to find, especially one the caliber of O-Ren’s chain whip yielding bodyguard in Kill Bill (Vol. 1) or Denzel Washington’s in Man on Fire, but Crichton’s character is just as resourceful and packs quite a punch.